Hand-sized is the perfect size, at least when it comes to home machine quilting with rulers. 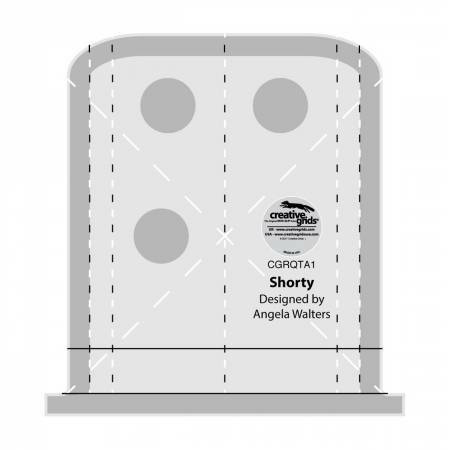 Designed by machine quilting teacher and author, Angela Walters, Shorty is just the right size to get the job done without being too big and inconvenient. Features- * Creative Grids grip helps prevent your ruler from slipping * Black and White dashed guide lines which are visible on all fabric colors * Palm-sized ruler allows you to keep control helping prevent breaking needles or crooked lines. * Curved edges allow for versatile designs * Needle stop notches help you stop in the right spot every time Use it for: Straight line quilting Concentric Squares Border designs Stitching in the ditch Geometric quilting and more!